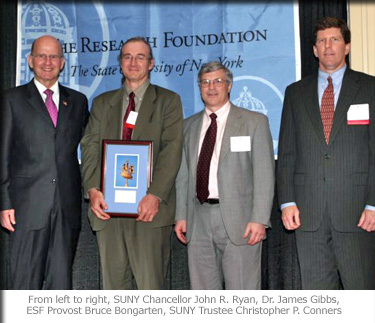 SYRACUSE  Dr. James Gibbs of the SUNY College of Environmental Science and Forestry (ESF) was recognized for excellence in research and scholarship by the SUNY Research Foundation. The award is the highest honor the Research Foundation can bestow on SUNY faculty for outstanding scholarly and research contributions in the humanities, arts, social sciences, sciences, medicine and engineering. Gibbs is an associate professor at ESF in the Department of Environmental and Forest Biology. His research interests lie in biodiversity conservation and ecological monitoring. He has built a thriving research program with many areas of interest, including designing ecological monitoring programs for U.S. National Parks, the conservation biology of giant Galapagos tortoises, and the ecology of such endangered species in New York as rattlesnakes and amber snails. Gibbs is helping to move forward three large NSF-funded projects as well as completion of a service effort to the United Republic of Tanzania/World Bank designing and implementing an ecological monitoring program for the Kihansi Gorge. He has served as principal investigator or co-principal investigator on grants totaling $5.7 million and has been an author on some 40 peer-reviewed articles as well as four books. Gibbs coordinates the college’s conservation biology major as well as the internship program for the Department of Environmental and Forest Biology and has received ESF’s annual Distinguished Teacher Award twice in the last four years.